When I “discover” an author, I love to dive back into his or her backlist and read…well, everything. I’m not alone! Many readers have asked me how to get their hands on books I’ve written that are now hard to impossible to find. Claim the Crown is at the top of that list, and I’m happy to say it’s now available in eBook for the first time and again in. print. I did a bit of updating but for the most part it’s the same as the original. It’s my first “single-title” novel and it hit stores the same month my son was born. He’s now a Web designer and developer in Boston. Ah, time flies… Claim the Crown was originally published by Worldwide Library, a mainstream fiction imprint under the Harlequin Enterprises’ umbrella. It was later reissued by MIRA Books. My editor was the late, great Kate Duffy, a remarkable woman with a wry wit and keen insight on writing and publishing. I feel so fortunate to have worked with her, if only on this one book. 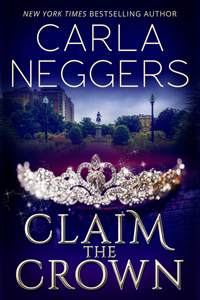 You can read more about Claim the Crown and find “buy” links here. Of its three covers to date, this one is by far my favorite. Many thanks to Kim Killion for her great eye and brilliant work. Happy reading, and happy January!